Log In - Register Now It's Free! ALBANY, Sept. 2 - The spy had made a daring foray behind enemy lines for a rendezvous with a highly placed agent and was rewarded with a trove of military secrets. But his escape plan fizzled, forcing him to try to return on foot through enemy territory. Just short of the border to safety, he was caught, unmasked and eventually executed. 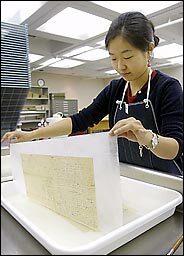 Sarah Kim removes a historical document from a chemical bath as part of a preservation effort at the New York State Archives. 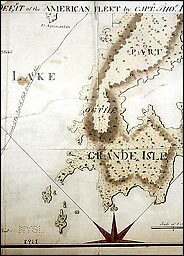 Above is a military map showing the American naval defeat at the Battle of Lake Champlain in October 1776. A pistol and sword owned by George Washington. It was not Cold War Berlin, but Revolutionary War New York. The spy was John André, a British intelligence officer, and his agent was none other than Benedict Arnold. In those pre-microfilm days, the secrets André carried away were written out in longhand on large papers that he folded up and placed in his boot. Today those papers - including a detailed chart titled "Return of ordnance in the different forts, batteries, etc. at West Point and its dependencies" - can be found in a small laboratory on the 11th floor of the State Archives here, where they are among many Revolutionary War-era papers that conservators are painstakingly working to preserve. In addition to plans showing how the forts at West Point were built, how many men were needed at each fort and what their artillery plans were, the archive holds some of the safe-conduct passes that Arnold, a major general who was then commandant of West Point, made out to help André escape after the ship that was supposed to bear him to safety - the Vulture - sailed off on the Hudson without him. One of the passes, dated Sept. 21, 1780, signed "B. Arnold, M Gen," is made out in André's cover name, John Anderson. It reads: "Permit Mr. John Anderson to pass the guards to the White Plains, or below, if he chuses. He being on public business by my direction." But when André was stopped just short of the border to safety by a group of militiamen, they found the incriminating papers stuffed in his boot. The jig was up. Arnold escaped. André was hanged. Benedict Arnold - whose name has come to stand for treason and betrayal - is not the only eponym represented in the collection. On a recent visit to the laboratory here, a document from the State Library's collection on the next table over was a letter signed by John Hancock, the man whose name is now used to mean a signature. Some of the state's documents and artifacts have been badly damaged over time, not only by the ravages of the Revolutionary War but also by a fire that tore through the State Capitol in 1911. Now the remaining Revolutionary War-era documents, culled from the collections of the State Archives and the State Library, are being preserved, thanks to a $164,000 grant in public and private money through the federal Save America's Treasures program, a national effort to preserve historic structures, documents and works of art. "It's time, we feel, to work to bring them back to a condition where they can be exhibited, shared with the public and digitized so copies can go up on the Internet," said Christine W. Ward, the state archivist. "We want to make sure that what is left is preserved for future generations." So, in a white lab coat, Maria Holden, the preservation administrator at the State Archives, pores over the documents. An intern, Marianna Neubauer, a 15-year-old high school sophomore, carefully tests the inks on the documents to see if they will run or dissolve in water. If they will not, Susan Bove, a conservator, places them on polyester sheets and carefully bathes them in trays of distilled water, and then dries them. Torn documents are reinforced with kozo paper, a long-fibered paper from Japan. It is finicky, hard work, and with thousands of historic documents to preserve for posterity, the conservators do not have the luxury of, say, art restorers, who can spend years on a single object. Some documents must be removed from old leather bindings they were placed in by past archivists, and placed in plastic sleeves to protect them. The state's archivists and librarians hope that the renewed interest in the Revolutionary War - with popular histories beginning to appear - will send scholars and authors here, where they hope they will soon be able to find data and insight by looking over the state's newly cleaned, newly legible documents. It is not only papers that must be saved, but also artifacts. The State Library has an impressive collection of George Washington's papers and effects, including one of his dress swords and pistols, a box of surveying instruments and a book of hand-colored engravings showing British regimental uniforms. There is a draft of his "Farewell Address" in his own hand, complete with crossed-out lines and other editing. And there is a book in which Washington evaluated other generals in the war, sometimes with brutal candor. One, he wrote, was "rather addicted to ease & pleasure - & no enemy it is said to the bottle." Another "by report, is addicted to drinking." Another was "lively, sensible, pompous and ambitious, but whether sober or not, is unknown to me." But apparently they were not all intemperate; Washington wrote of one brigadier general who was "sober, tolerably sensible and prudent." Get The New York Times for as low as $2.90 a week. How can you listen to iTunes on your cellphone?